Since the beginning of the year, seventh- and eighth-grade students who participate in an Animal Club at the school have been taking care of the replies that were donated to Crisan. Those students, who aren’t a big fan of the snakes, instead help take care of – and learn more about – the two rats that were also donated to her class. 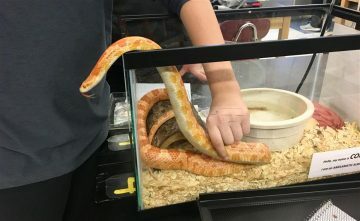 If classwork is completed, then students in Crisan’s other science classes are given what’s called “animal time” on Fridays to interact with the snakes. Niblet is also a regular-pattern corn snake and is about 17 years old. Although he resembles Cob, he is darker in color. When he was a hatchling, his tail was stepped on, so his it’s much shorter than the others.